Proper pallet stacking provides two very important outcomes in a warehouse. One is improving safety. The other is cutting costs and improving productivity. Stacking pallets correctly help prevent accidents that can occur when using a pallet jack, forklift, hand pallet pump, or other lifting machine. Combining safe pallet stacking with advanced storage and handling techniques – such as double-stacked pallets – helps trim costs by working more efficiently. The key to achieving these outcomes is knowing what you’re doing. That starts with thorough training in all aspects of forklift and other lift machine handling. And there’s no better way to acquire that training than at CertifyMe.net. We also offer pallet jack and order picker courses. We teach how to safely use both indoor lifts and rough terrain forklifts. We cover everything you need to know, from basic operating theory to advanced cargo handling techniques, including double-stacked pallets. Best of all, our forklift training won’t interfere with work time. Our learn-as-you-go pace allows your staff to get OSHA-certified training from anywhere, at any time. During lunch. Late at night. Whatever fits their schedule. As long as you have a reliable internet connection, CertifyMe.net has the training and resources you need. Falling objects, loads stacked the wrong way, and unsafe use of forklifts can lead to accidents and injuries. You can reduce these risks by teaching people proper pallet stacking, starting with these tips. 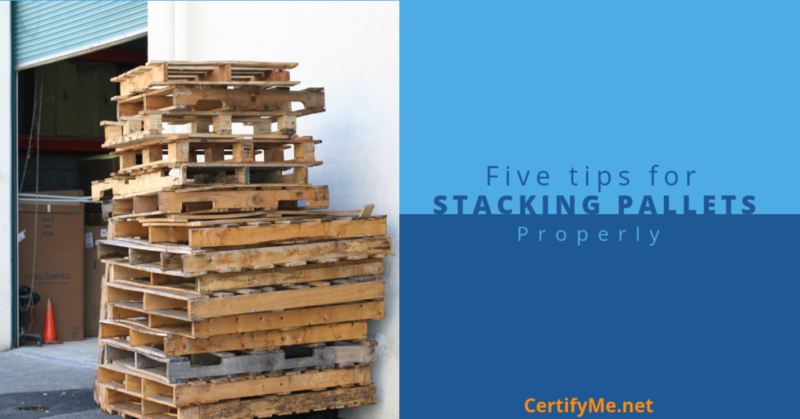 Stacking pallets of the same size will produce an evenly distributed stack. This will reduce the chances of the stack shifting or falling. It also reduces the amount of empty space between stacks, making it the most efficient way of stacking. When working with different-size pallets, always place the largest item on the bottom row. This also applies to the products on the pallet. Stacking items of uniform size and shape next to each other will prevent products from shifting and falling. When dealing with double-stacked pallets, be sure to use proper lifting aids. These include bars, stabilizers, and other tools that enhance lift safety. Another safety tip: make sure your double-stacked pallets are always the same width. Accidents are more likely to happen if your pallet configuration varies with any given load. The first rule of proper pallet stacking is never stack them too high. Doing so greatly increases the risk of the top pallets falling over. It also increases the risk of injuring or killing workers on the ground. Know how much space you have on the lower and middle racks. Then make sure not to stack pallets too high on the top rack. Over-stacking pallets can cause them to tumble off the racks during loading and unloading. Even when there is extra room on the top rack, don’t over-stack. This can cause goods to fall and suffer damage when loading or unloading the pallet. Pallet stacking often involves fairly heavy items. So make sure the operator knows the maximum weight the pallet jack or forklift can hold. Lifting more than the forklift is designed to hold presents a serious safety concern. If the forklift topples over, it can injure the operator or crush workers nearby. Pallets often contain items of mixed size, shape and weight. The proper safety technique is to put the heaviest item(s) on the bottom of the pallet. Then put the heaviest pallets on the bottom of the stack. This will create a stable base with a lower center of gravity. When hauling double-stacked pallets, make sure the load doesn’t exceed the forklift’s max weight limit. An overloaded forklift can cause an accident before the pallets are even stacked. Warehouse safety requires stacking pallets evenly. This means no edges poking out the sides. Uneven stacking causes an unstable pallet stack. This increases the chances of the stack falling from the forklift or rack during transportation. Stacking pallets evenly also ensures the weight is properly distributed to avoid shifting. Objects sticking out from the edge of the stack also present a safety problem. Forklift drivers can accidentally bump into the protruding pallet, causing the entire stack to topple over. Also, keep an eye out for any loose parts that could be snagged by a machine or worker during loading and unloading. It can be tempting to reuse damaged pallets to save a few dollars here and there. However, it’s never safe to reuse damaged pallets. They aren’t as stable and durable as undamaged pallets, which can lead to stack tip-overs. Any part of the pallet that contains splintered areas or protruding nails and fasteners can injure workers. When in doubt, do the right thing and buy replacement pallets rather than using damaged ones. Forklift drivers should understand that double-stacked pallets create unique safety hazards, and should always be handled with extra caution. Using plastic wrapping and banding can lower the risk of accidents by keeping pallets secure. If you’re unsure about handling a double-stacked pallet, consult with your job site manager or safety expert. According to OSHA, “cargo, pallets and other material stored in tiers shall be stacked in such a manner as to provide stability against sliding and collapse.” The instructions listed above are the most critical for ensuring the stability of stacked pallets and preventing accidents. Workers that use forklifts, pallet jacks, and pallet pumps to move and stack pallets must know how to correctly stack pallets. They also need to know how to use the equipment properly. OSHA says that proper pallet stacking requires workers to be aware of both manual handling concerns and equipment handling techniques. Workers should always move and stack pallets according to their weight, size, and shape to avoid overloading the equipment. Center the load on the forks as close to the forklift mast as possible. This will help prevent tip-overs of the equipment or load. Never overload a lift truck past its rated capacity. Do not put extra weight on the rear of a counterbalanced forklift to allow an overload. Adjust the load to the lowest position when traveling. When possible, correctly pile and cross-tier all stacked loads. Ensure workers have the proper personal protective gear. This includes gloves, hats, goggles, and steel-toe boots. Keep storage areas free of materials that can cause tripping hazards or fires. How High Can You Stack Pallets in a Warehouse? Stacking pallets high can be useful – up to a point. It frees up more stacking space, which allows you to store more products or materials. It also reduces tripping and collision hazards from your warehouse floor. However, go too high and your pallet stacking won’t comply with OSHA standards. Exceeding the recommended height limit makes pallet stacks more prone to tip-over and collapsing. However, height limits can vary according to whether the pallets are full or empty. They also depend on the stacking technique used. The materials being stacked can also affect the height limit because some have specific requirements. Do not store pallets within 25 feet of other materials. Install special sprinkler systems when using plastic pallets, which have a higher heat release than wood. Store unused pallets outside and away from buildings when possible. Stacking and moving pallets can be dangerous. All it takes is one improperly stacked pallet rack to cause an accident that leads to serious injury or death. That’s why learning how to properly stack pallets requires specialized training. This training should include forklift operators and other workers who handle pallets. Forklift accidents happen every day. The most common cause is operator error. In fact, operators without training are the most likely to be involved in serious accidents. Tip-overs and collisions involving forklifts are also common in warehouses. So are accidents involving pallets. Workers must be able to perform these tasks in all kinds of work settings. This requires a unique set of skills that can only be acquired through training and practice. Pallet stacking training is also important for employers. OSHA requires that all workers are trained and certified for forklift use and pallet stacking. If not, employers risk heavy fines and possible legal action from OSHA. Forklift and pallet stacking training from CertifyMe.net is fast, easy and affordable. It also ensures workers know how to stack a pallet properly and prevent accidents on the job. We offer pallet stacking, pallet jack, order picker, and warehouse forklift training. Our training is all online. It takes only about one hour to complete. You can take the training using any connected device. Every course is 100% OSHA-compliant. And you get free three-year renewals for life. Sign up today! Whether you want to learn how to handle double-stacked pallets or simply brush up on your overall safety knowledge, our training courses will get you OSHA-certified in no time at all. Call us today!